In what's proving to be a turbulent year for the local beer industry, few have been riding the roller coaster with quite the same gusto as Rocks Brewing. In recent weeks, it was announced their brewery is up for sale while last week their Conviction collected the trophy for Champion Specialty Beer at the Craft Beer Awards, where flagship Hangman pale ale grabbed a gold too. 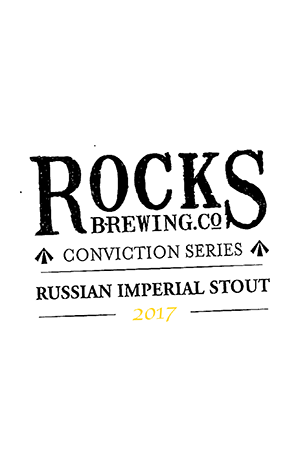 At the other end of the flavour spectrum is a beer for which they won a gold at last year’s competition: a Russian Imperial Stout. This year's version wasn't ready in time for inclusion in this year’s competition, but is ostensibly the same beer that got the glory last time. That means eight varieties of malt, a splash of oats, Super Pride hops and some house-made Belgian candi sugar. The last of these was evidently the one aspect to be changed (being increased ever so slightly) and that sweetness is noticeable at first, though it gives way to all manner of luscious flavours thereafter: dark chocolate, liquorice, dried fruits and a rich, roasted bitterness. It’s big and bold and, at 10.5 percent ABV, there’s most certainly booze in there, but, like last year, it doesn't feel out of balance and is never a struggle to drink. With potential changes afoot in Alexandria, whether we’ll see this beer made again remains to be seen. Here’s hoping, but, if not, it’d be quite the way to bow out.